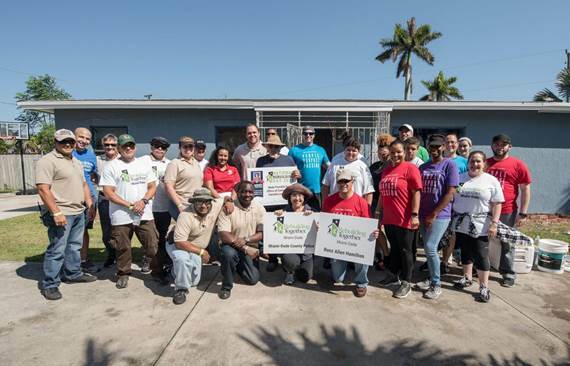 MIAMI-DADE – County Commissioner Daniella Levine Cava partnered with Rebuilding Together Miami-Dade to sponsor National Rebuilding Day 2018 in South Dade on Saturday, April 28. Nearly 200 volunteers answered the call to service and joined forces to make critical repairs to 17 homes of veterans and seniors, and to help revitalize the Leisure City neighborhood. 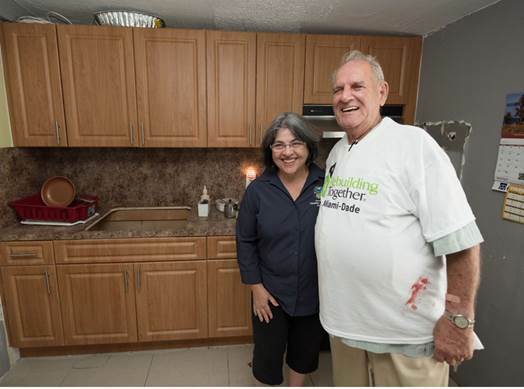 "I was excited for the opportunity to partner, once again, with Commissioner Daniella Levine Cava to provide critical home repairs for 17 vulnerable homeowners in Leisure City,” said Rebuilding Together Executive Director Travis Renville. National Rebuilding Day is a labor of love and would not be possible without hundreds of community volunteers and dozens of generous community partners. Thanks to everyone involved, these families now have safe, healthy, and accessible homes to age in place, independently." Retiree Tomas Martinez shows his completely renovated kitchen to Commissioner Cava. Volunteers provided Army veteran Edwin Velez (center, standing) with a new roof, renovated bathroom with walk-shower, and exterior painting and landscaping.